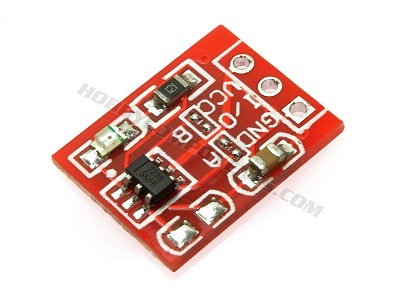 A capacitive touch sensor module based on the dedicated TTP223 touch sensor IC. The module provides a single integrated touch sensing area of 11 x 10.5mm with a sensor range of ~5mm. An on-board LED will give a visual indication of when the sensor is triggered. When triggered the modules output will switch from its idle low state to high (default operation). Solder jumpers allow for reconfiguring its mode of operation to be either active low or toggle output. Will this module work if the sensor is placed behind a piece of perspex? Yes, the module will work behind most types of material so long as they don't block or interfere with electromagnetic signals and the materials thickness does not exceed the maximum sensor range. Libraries, example code, and diagrams are provided as an additional free service by Hobby Components and are not sold as part of this product. We do no provide any guarantees or warranties as to their accuracy or fitness for purpose. Can someone please explain to me as I'm a bit thick when it comes to electronics how to switch this module to low power toggle mode? Although the TP223 has a low power/ fast mode feature the SOT-23 version of the device used in these modules does't have the pin (LPMB) to select it. If I understand the datasheet correctly I believe the device is permanently fixed to fast mode. To switch the module to toggle mode you need to bridge the two pads marked 'B' with a small blob of solder. This will pull the TOG pin high switching it to toggle mode. Great little sensor. However, one thing a bit strange is that if the sensor is continuously touched, the output does not maintain a constant "on" output but interrupts briefly for about 0.5sec approximately every 7 seconds. In the game project I am working on, it would be useful if it doesn't do this but stays "on" for however long it is touched. Anyone any ideas how to change this ? This is unfortunately the normal operation so I'm afraid it is just a 'feature' of the sensor. Being a Chinese IC the datasheet looks like it's been translated so it's a bit difficult to determine what the wording of the datasheet is exactly implying but I suspect that it's either the low power mode or the auto calibration circuit kicking and causing the interruption. The only solution I can think of would be to use a resistor and capacitor to smooth out the gap but then this would also mean there would be at least a 0.5 second delay between pressing the button and the output changing. Thanks Andrew for the clarification. I'm using a PIC microcontroller between the sensor and the game system so I'll just program it to "lag" for 0.5sec or so before responding to another input. Great support ! Hello does anyone know what colour the led is on the pcb, and how bright it is ? The colour is red. It's a bit hard to describe the brightness without being subjective but I would describe it as very bright. Now I'm pretty new to electronics but it feels like this should be feasible! Can anyone point me in the right direction? I can't seem to find a simple way to use these touch sensor buttons as a power switch. I can't seem to find a simple way to use these touch sensor buttons as a power switch. 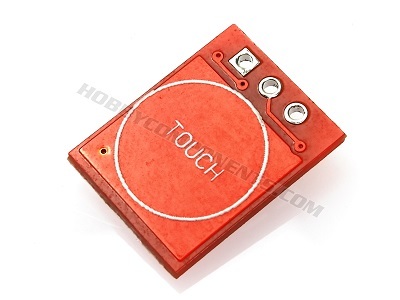 You can just connect the output of the touch sensor module to the input of the relay module and it will directly drive it.